TURIN, Italy — Juventus says Cristiano Ronaldo only sustained an "apparently minor" injury when playing for Portugal but did not offer a timeline for his return. 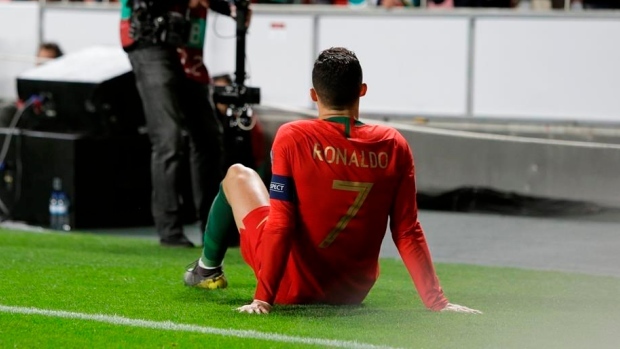 Ronaldo limped off after half an hour of Portugal's 1-1 draw against Serbia in qualifying for the 2020 European Championship on Monday. Juventus said Tuesday that tests in Portugal revealed "an apparently minor injury to his right thigh flexors." The club added that Ronaldo will undergo more tests when he returns to Turin to "determine when he can resume competitive activity." Ronaldo himself told Portuguese media after the match that he "should be back in one or two weeks." Juventus travels to Ajax for the first leg of the Champions League quarterfinals on April 10 before hosting the Dutch team the following week. Ronaldo scored a hat trick against Atletico Madrid in the return leg of the last 16 as Juventus overturned a first-leg deficit.